Do you want to be a writer? If so, Write from the Heart (formerly titled Writing from the Heart) is the book for you! It contains dozens of practical, down-to-earth writing exercises that help both emerging and established writers learn how to capture the emotional truths of their lives into powerful stories. Chapters are broken down into the elements of fiction: place, action, characters, monologue, dialogue, point of view and plot. Write from the Heart can be used by individuals or in writing groups and classrooms. This new edition has been expanded to include a section on writing poetry, and the chapter on publishing has been completely updated and revised. 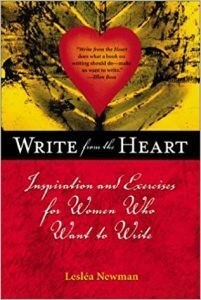 I taught writing workshops called Write from the Heart for many years. When I stopped teaching, I decided to put all the exercises I had used in my workshops into a book so that anyone who wanted to learn how to write fiction could use the exercises as a tool. When I don’t know what to write next, I often do a writing exercise from my own book to get me started again! Of all the elements of fiction, character is the most important. When I think about my life and what is most important to me, the first thing that comes to mind are the people I know and love. It’s the same with writing fiction. The characters who people your story are what will concern you, move you, amuse you, intrigue you, inspire you and surprise you. A character you choose to write about can be based on any of the following: yourself at any age, anyone you know, anyone you don’t know (such as a famous person), a composite of several or many people rolled into one, a perfect stranger, or someone you haven’t a clue about and are making up as you go along. The only essential ingredient in choosing a character to write about is that he or she be someone you love. Though you must love your characters, you don’t necessary have to like them. In fact, you may even hate some of your characters, but you must love them as well. One way to define love is “paying attention to.” Thus, the opposite of love is not hate (which takes a lot of attention) but not caring at all. So when I say you must love your characters, what I mean is you must pay attention to them and care about them enough to notice every detail about them. Choose your characters carefully, as you will be spending a great deal of time with them.